I've been using Windex Touch Up cleaner, in the Glistening Citrus scent, for the last couple of weeks on my kitchen counters in place of using cleaning wipes. 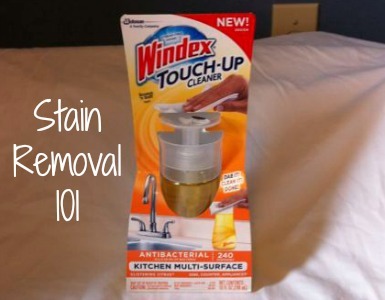 Overall, I've really enjoyed this product and think that it works pretty well -- just as well as disinfecting or clenaing wipes, or spray on type cleaners really. If you're not familiar with what this product is, it is an all-purpose or multi-surface cleaner, which you dispense by pressing your hand down onto the push lever on top of the product while holding either a paper towel, cleaning cloth or a clean sponge. 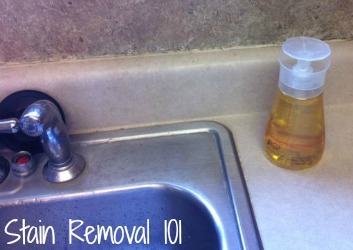 When you do this some of the cleaner squirts onto the paper towel, or whatever else you're using, and you can easily then wipe down the counter, sink, or appliances. The advantage of this delivery system, as opposed to spray bottles or a canister of wipes is that you can keep it out on your counter to just use as needed, whereas I don't think a spray bottle or other containers looks too nice just sitting out for later use. it in the same way you'd use a disposable cleaning wipe. If you use paper towels with it, than it is basically like just wetting your own wipe for use as you need it. Of course, if you prefer to reuse cleaning cloths this type of product allows you to do it, without having to deal with sprays, if you don't like them. I will note that this product is advertised as being antibacterial. For it to actually sanitize hard non-porous surfaces though the directions say you have to "use enough product to thoroughly wet the surface for 10 seconds." Overall, I have enjoyed using this product and it does well for touch up cleaning of my kitchen counters and sink. If you don't have too small of kids who could get into a cleaning product that is left out in the open, this might be a convenient choice for your home. However, it is mainly just a new delivery system -- sprays and wipes will work just as well if you prefer them. 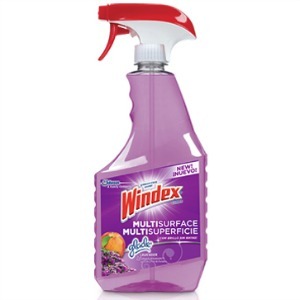 Have you used the Windex Touch Up cleaner, or any of the other multi-surface sprays? If so, I'd love to hear from you sharing your experience. You can share your review here or read other all purpose cleaner reviews that have already been submitted. I recently bought a bottle of Windex Multi-Surface cleaner with Glade scent. It works great on everything from glass to bathtubs. But the best thing about it is it smells so good, and freshens the room for hours. My son actually likes cleaning now because it smells so good. Today he even asked if there was anything else he could clean. I'd pay 10x the regular price for that effect! Thanks so much for this review. I always love products that get kids to clean, and if it can motivate an adult as well, wonderful too! As you can see there are both spray versions and the newer touch up versions of Windex's multi-surface cleaning products. Obviously the company has expended from just cleaning glass and windows by now. Has anyone else used any of these products for their home? If so, I'd love to hear what you thought of them. You can share your review here and I'll add it to the site. The spray has saved my kitchen!! It smells great and is inexpensive! !